PTT has changed so that there is now a 3% tax on amounts over $2,000,000.00. The 3% tax is only paid on the amount over $2,000,000.00, not the full price. Who is looking to buy some pre sale properties? Posted in Real Estate Related | Comments Off on Do you understand the new down payment rules? It’s been vacant for a decade. A proposal to preserve it fell through more than two years ago. But Vancouver’s historic Wilmar residence may yet be saved from the wrecking ball. Developer James Evans has come up with a new heritage revitalization proposal that would see the estate’s house and coach house restored and five infill buildings added to the almost two-acre lot at 2050 Southwest Marine Dr. The 9,000-square-foot main house would be divided into two units, while the coach house, which is a three-car garage with space above it, would be rehabilitated with the space above turned into amenity space for the residents. Such a redevelopment would be a first for one of the large estates along Marine Drive. Evans, who was involved with the earlier proposal, is optimistic his revised plan will be approved. The City of Vancouver’s communication department told the Courier in an email that the city is “pleased” the owner is pursuing retention and rehabilitation, although the city can’t discuss details since the application hasn’t been officially submitted yet. Built in 1925, the Tudor-style Wilmar residence has heritage B status, meaning it’s registered but not designated, so it could be knocked down. It’s considered one of the great estate properties on Southwest Marine Drive and in Vancouver. The five-bedroom home landed on Heritage Vancouver’s 2012 endangered sites list. The organization considers it valuable because of its architecture, history and historical associations. “Wilmar” combines the names of Willard and Mary Kitchen. The Kitchen family and its descendants occupied the house until 2006 when Judith Jardine, the last living family member, died. The estate was eventually sold to Evans and his business partners for $7.5 million. While the fundamentals of the house are in good shape, and the outside has been well looked after, the inside is largely the same as it was when it was built in 1925. The rehabilitation effort will include ensuring Wilmar meets the requirements of the modern building code. Evans’ ongoing interest in the Wilmar redevelopment project is both personal and professional. “My hairline’s a lot further south than it was when I started, and there are a few more grey hairs in there,” he joked. When he first became involved, Evans said it looked like a viable project and one that would be fun to do since he enjoys fixing heritage homes. “It’s important for us to try and preserve a little bit of where we came from in the City of Vancouver because we spend so much time looking forward and trying to figure out how we can be the latest and greatest in whatever it is. [But] we can’t forget where we came from,” he said. Evans is well versed in heritage restoration. He was behind the Jeffs Residence rehabilitation project at 1298 Salsbury Dr. in Grandview-Woodland. That saw the restoration and retention of a Queen Anne Revival-style home with 13 infill townhomes added to the property. Evans hopes to replicate that concept through another heritage revitalization proposal he’s involved in that aims to save the Brookhouse Residence, a landmark home in Grandview-Woodland at 1872 Parker St. The home was built in the Queen Anne Revival style, with a corner turret, in 1909 and named for printer and editor Arthur A. Brookhouse, who owned it and lived in it with his family from 1927 until his death in 1947. If the proposal is approved, the house will be rehabilitated and divided into six strata units, while four infill townhomes would be built along the rear lane. A January open house attracted about 50 people. It was generally well received, according to city staff, but the application is still under review and a public hearing date has not been scheduled. If Evans gets the green light on the Wilmar and the Brookhouse project, he hopes to start construction on both properties this summer. Surging sales in the piping hot real estate markets of Toronto and Vancouver last month prompted one of Canada’s big banks to express concerns Tuesday that the cities may be at risk of a home price correction. The Canadian Real Estate Association reported Tuesday that sales of existing homes rose by eight per cent in January compared to a year ago, while the national average home price soared 17 per cent. But it was the sales figures for Vancouver and Toronto that drew considerable notice from economists. The average sale price in greater Vancouver rose 32.3 per cent year-over-year to nearly $1.1 million, while in greater Toronto it climbed 14.2 per cent to $631,092. The Multiple Listing Service benchmark price – a figure that CREA says is more representative of the market – rose to $775,300 in great Vancouver, an increase of roughly 21 per cent compared to January 2015. In greater Toronto, the benchmark price climbed roughly 11 per cent year-over-year to $578,400. TD economist Diana Petramala said some of the strength in the Toronto and Vancouver markets may have been bolstered by buyers looking to get into the market before new mortgage down payment rules took effect Monday. New federal regulations require larger down payments on homes that cost between $500,000 and $1 million. “While we continue to believe that things just can’t any hotter, markets in B.C. and Ontario continue to prove us wrong,” Petramala said in a note to clients. Petramala said although foreign investment and immigration are likely to provide support to the Toronto and Vancouver markets in the months ahead, she raised concerns about whether sky-high home prices in those regions are sustainable over the long term. “Every month of double-digit home price growth raises the risk of a deeper home price correction down the road,” Petramala said. A correction is defined as a drop in value of at least 10 per cent. The price gains in Vancouver and Toronto fuelled a rise in Canada’s national average home price in January to $470,297, CREA said. When excluding Ontario and British Columbia, however, the average sale price actually edged lower by 0.3 per cent from a year ago to $286,911. Regional differences stemming from the impact of the oil price shock are likely to continue throughout this year, said BMO economist Robert Kavcic. “Those markets exposed to oil prices are correcting,” he said in a note. On a month-to-month, seasonally adjusted basis, CREA says national home sales rose 0.5 per cent in January, compared to December of last year. Meanwhile, the number of new listings on MLS declined by 4.9 per cent in January compared to December. “Tighter mortgage regulations that take effect in February may shrink the pool of prospective homebuyers who qualify for mortgage financing and cause national sales activity to ease in the months ahead,” CREA chief economist Gregory Klump said in a statement. Just how much will recent home buying changes impact the real estate market in B.C? Just how much will recent home buying changes impact the real estate market in B.C? One veteran lays it all out. But that doesn’t mean the changes won’t impact individual buyers. British Columbia’s finance minister, Mike de Jong, announced earlier this week that buyers purchasing newly built homes valued under $750,000 can save up to $13,000 through a land transfer tax break. This change will encourage a number of buyers — both first-time and repeat — to jump off the fence and into the market, according to Woodhouse. On the flip-side of the changes, however, are purchasers of luxury homes. Under the new changes, they will pay higher land transfer fees. “A client purchasing a $4,000,000 home is not slowed by a $20,000.00 increase in purchase taxation; they will still pay the four million, it is a non-issue,” Woodhouse said. “A mosquito bite, not the sting of a hornet. Posted in Real Estate Related | Comments Off on Just how much will recent home buying changes impact the real estate market in B.C? Anbang Insurance Group Co. Ltd., a Beijing-based company with a reported US$114 billion in assets, is buying what amounts to a 66 per cent stake in Bentall I, II, III and IV ? a sprawling commercial 1.5-million-square-foot office complex, with some retail, in the heart of Vancouver. 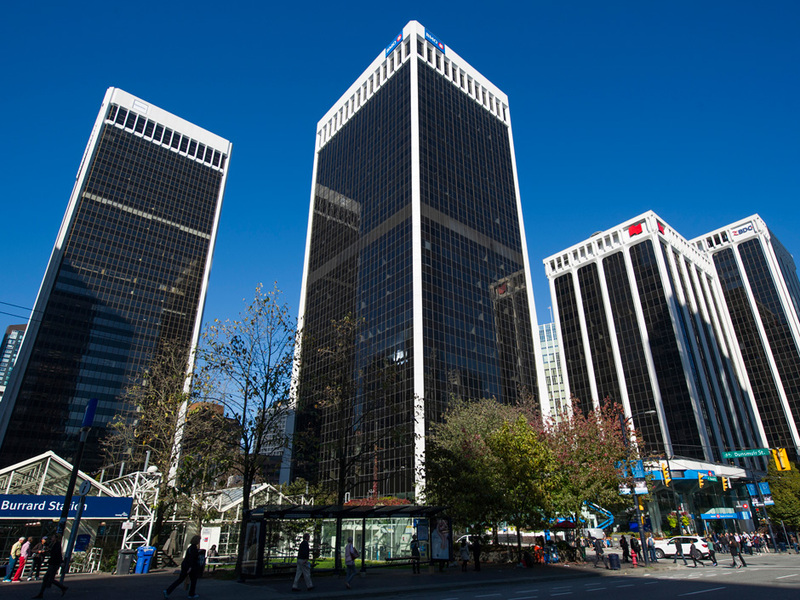 Chinese investors have won one of the most important commercial real estate auctions in Vancouver history, swooping in to grab a controlling interest in all four towers of the Bentall Centre. Sources confirmed to the Financial Post that Anbang Insurance Group Co. Ltd., a Beijing-based company with a reported US$114 billion in assets, is buying what amounts to a 66 per cent stake in Bentall I, II, III and IV — a sprawling commercial 1.5-million-square-foot office complex, with some retail, in the heart of Vancouver. It was reported in October that Ivanhoé Cambridge Inc., a subsidiary of Caisse de dépôt et placement du Québec, was selling its stake in the four towers. The price paid by Anbang values the entire complex at more than $1 billion, according to sources. The deal has not yet closed. Anbang has been been looking for more opportunities in Canada after paying $110 million last year for a land lease of HSBC Building at 70 York St. Toronto. The Chinese company bought the land lease, which gives it ownership of the building for a set period of time, from Brookfield Office Properties in what was considered one of the highest recent valuations for a building in Toronto. But the insurance company’s biggest North American splash was probably in 2014 when it bought the famed Waldorf Astoria in New York City for US$1.9 billion. Bentall Centre would be its largest foray into Canada — as it takes over the Ivanhoe stake. Each tower has a slightly different ownership structure but Great West Life Assurance effectively controls 34 per cent of the the four centres combined. The deal continues to show the appetite of Chinese investors for the Canadian market, especially in Vancouver where concerns continue to rage about Asian buyers moving into the city’s residential market. Interest in Vancouver office space has not been confined to just Asian investors. Attracted by the struggling loonie, European investors have also been eyeing the market. German multi-billionaire Klaus-Michael Kuehne is said to to have paid $400 million for Royal Centre, a 36-storey building at 1055 West Georgia Street, last month. Ross Moore, an independent real estate consultant, said Chinese investor interest is probably at an all-time high. “We’ve seen it on the residential side but now it’s on the commercial side,” he said. Moore said he can’t recall a bigger deal in Vancouver commercial history, when the four buildings are considered as one entity. Scott Chandler, senior vice-president of advisory and investment sales with Colliers International, said the weak Canadian dollar continues to drive interest in commercial real estate, but the appeal of Vancouver can’t be ignored. “It’s very hot and very strong. It’s a high growth area with a large urban population and limited land. All this is driving up prices,” he said. The appeal to Chinese investors is also pretty simple: “It’s a safe haven in a safe financial system,” he said. Here is what we know: 1. There are no changes to the first time home buyer exemption limits; 2. All buyers (whether first time buyers or not) no longer pay PTT on purchases of NEW homes up to $750,000 in value; note the buyer must be a Canadian citizen or a permanent resident; there is a partial exemption for homes between $750,000.00 and $800,000.00; 3. PTT has changed so that there is now a 3% tax on amounts over $2,000,000.00. The 3% tax is only paid on the amount over $2,000,000.00, not the full price. These are effective for deals closing today and going forward. We had one client close on a new home yesterday, and we believe they are out of luck. We also had one client that was to close today on a $4,000,000.00 purchase, but we moved the completion to yesterday to save the client $20,000.00 in PTT. The First Time Home Buyers’ Program reduces or eliminates the amount of property transfer tax you pay when you purchase your first home. If you qualify for the program, you may be eligible for either a full or partial exemption from the tax. For example, if you qualify and purchase a property with a fair market value of $400,000 with a person that doesn’t qualify you would still qualify. If you owned a 60% interest in the property, 60% of the tax amount would be eligible for the exemption. To apply for the First Time Home Buyers’ Program you need to complete the First Time Home Buyers’ Property Transfer Tax Return when you or your legal professional register the property transfer. After you have applied you must meet additional requirements during the first year you own the property to keep the tax exemption. If the owner passed away, or the property is transferred because of a separation agreement or a court order under the Family Law Act before the end of the first year, you still qualify to keep the tax exemption. Watch for more information on today’s budget in next week’s edition of our REALTOR® News. You are currently browsing the Les Twarog Vancouver Real Estate and Condo Blog blog archives for February, 2016.